BATON ROUGE, La. (AP) If No. 19 LSU is to knock off the nation’s top-ranked team, three-touchdown-favorite Alabama, a number of first-year Tigers will have to come of age in the toughest game of their young careers. At least four freshmen are expected to start for LSU in Tuscaloosa on Saturday night, including true freshmen Ed Ingram and Saahdiq Charles on the offensive line. Some eight more true or redshirt freshmen could be rotating in regularly in what will be their first experience against a Crimson Tide program that has largely dominated the Southeastern Conference since 2009, and which has beaten LSU six straight times. LSU has had as many as 20 true freshmen – players who were in high school last year – see action this season. About a dozen first-year players – including ”redshirt” freshmen who did not play in 2016, or at least not enough to use up a year of eligibility – have played regularly for the Tigers this year. 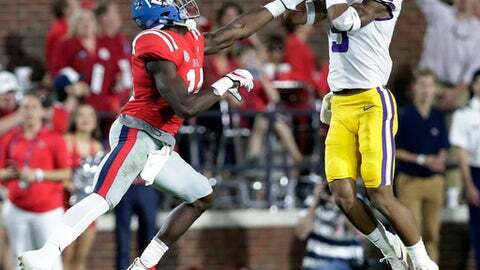 Freshmen Andraez ”Greedy” Williams and Grant Delpit start in LSU’s defensive backfield. But opposing quarterbacks have paid this season for going after them. Williams has three interceptions and Delpit got his first in LSU’s previous game, a victory at Mississippi on Oct. 21. Freshman outside linebacker K’Lavon Chaisson started early this season while top pass rusher Arden Key was rehabilitating from shoulder surgery. He’s played less as Key has rounded into form, but still rotates in regularly and has two sacks this season. Two other freshmen – Jacob Phillips and Tyler Taylor – also rotate in at linebacker. Freshman Eric Monroe started at safety earlier this season when junior John Battle was hurt and now subs in as needed. Freshman Glen Logan has played at defensive end. In addition to Ingram and Charles, tight end Jamal Pettigrew, fullback Troy Carter and lineman Austin Deculus are among freshmen who’ve contributed regularly on offense. LSU normally limits interview opportunities for freshmen, and none met with reporters this week. With LSU (6-2, 3-1 SEC) now eight games into the season, and having demonstrated improvement during a three-game winning streak, senior quarterback Danny Etling said he doesn’t expect the Tigers’ relative youth to be as much of a factor as it might have been earlier this season, when the Tigers were routed at Mississippi State and upset at home by Troy. Etling said he’s certain that his freshmen linemen – the 6-foot-4, 314-pound Ingram and the 6-5, 321-pound Charles – can match up physically with Alabama’s imposing defensive front. ”Are they ready to block those guys as freshmen? We’ll find out,” Orgeron added. And if the Tigers need a big play in the kicking game, LSU punter Zach Von Rosenberg and place kicker Connor Culp are freshmen, too.